At the forefront of water pollution, stormwater runoff is the greatest threat to clean water in the United States (Swamikannu, Radulescu, Young, & Allison, 2003). Stormwater runoff looks like a simple flow of clean, natural rainwater that pours into drains on the street and eventually back into the nearby surface water. 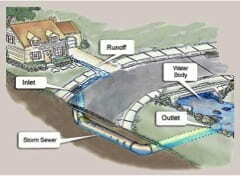 However, this flow of stormwater can be deceptively harmful. Stormwater runoff is the result of precipitation that flows over land or impervious surfaces (EPA, 2003a). It becomes an environmental threat when it flows and collects numerous types of pollutants, such as sediments, oils, or fertilizers. The resulting contaminated water subsequently enters local stormwater sewer systems and is released into surface water bodies, causing great harm to the environment. A well-known and ongoing water quality issue in Massachusetts (MA) is the health of the Charles River. Stormwater pollution in the Charles River Watershed is “a chief culprit in dramatic algae blooms… that have plagued the river in recent years” (EPA, 2013b). The United States Environmental Protection Agency (US EPA) believes that phosphorus levels caused by stormwater runoff must be reduced by 54% to restore the Charles River to a healthy state (EPA, 2013b). Stormwater pollution in water bodies like the Charles River threaten their capability for recreational use and degrade fish habitat and aesthetics. In rural areas, stormwater can naturally penetrate into the ground and filter into the underground flow of groundwater. However, urbanization has increased the amount of surfaces that are impervious or impenetrable. By forcing the stormwater to flow over impervious surfaces as opposed to penetrating the ground, stormwater runoff collects debris and contaminants along its path to a water source (Robert, 2007). Many urbanized areas have catch basins that collect stormwater runoff and reroute it, via underground piping, directly into rivers, streams, ponds, lakes, and oceans. Unlike sanitary wastewater, stormwater runoff is untreated throughout its journey to surface water bodies. The point at which untreated stormwater is discharged into a surface water body is called an outfall. Catch basins, piping, manholes, outfalls, and other stormwater infrastructure are collectively known as a Municipal Separate Storm Sewer System (MS4). A simplified example of an MS4 can be seen in Figure 1. MS4s are considered a form of point source pollution because contaminated stormwater is being discharged from an identifiable place – outfalls. Point sources of pollution are considered to be relatively easy to regulate because each point source is at a known location and the owner of the source can be identified (Oana, Ioan, & Andrei, 2010). Conversely, stormwater outside of the MS4 is considered a form of nonpoint source pollution since runoff is collecting debris from many diffuse sources. Nonpoint source pollution is difficult to control because pollutants can accumulate from a wide array of locations and can flow directly into surface water bodies. An example of how nonpoint source pollution can cripple a body of water is the Bosque River Watershed in Texas. The river is surrounded by dairy farms. Despite only 30% of the surrounding land being impervious, the polluted runoff filled with the manure and fertilizers from the approximately 100 dairy farms has forced the US EPA to list the river as impaired (Santhi, Arnold, Williams, Hauck, & Dugas, 2001). In 1990, the US EPA created the MS4 Permit under the National Pollutant Discharge Elimination System (NPDES) of the Clean Water Act to address the problem of stormwater pollution. The MS4 permit establishes six minimum control measures that municipalities must comply with: 1) Public Education & Outreach; 2) Public Participation/Involvement; 3) Illicit Discharge Detection & Elimination; 4) Construction Site Runoff Control; 5) Post-Construction Runoff Control; 6) Pollution Prevention/Good Housekeeping (EPA, 2003b). The currently active MS4 permit for most municipalities in Massachusetts was released in 2003. New Hampshire (NH) was issued a MS4 draft permit in February of 2013. The requirements for the 2013 NH draft permit are far more extensive than those in the active 2003 MA permit. Stormwater officials believe that the 2013 NH draft permit is a strong indicator of the contents of the upcoming MA permit. As some municipalities are struggling to comply with the current 2003 MA permit, the comprehensive requirements of the 2013 NH draft permit will pose a challenge to many towns and cities across Massachusetts. The overall goal of this project was to improve stormwater management programs (SWMPs) in Central Massachusetts municipalities. We worked with the Massachusetts Department of Environmental Protection (MassDEP) to help the towns of Auburn, Holden, and Upton prepare for upcoming MS4 permit requirements. In order to successfully achieve our goal, we completed the following objectives: 1) assess the current success of municipalities’ stormwater management programs; 2) act as an informational resource to municipalities on stormwater management; 3) assist municipalities with mapping and delineation of catchment areas, and 4) create a catchment priority ranking database. In order to complete our objectives, our team analyzed both the 2003 MA permit and the 2013 NH draft permit, along with the stormwater management documents of Auburn, Holden, and Upton. We also interviewed several municipal stormwater officials, municipal employees whose responsibility it is to manage a town’s stormwater program. The position of stormwater official varies within each town. Throughout our project, we worked with Assistant Town Engineer in Auburn, Senior Civil Engineer in Holden, and the Director of Public Works Department in Upton. Additionally, we interviewed officials from the MassDEP, US EPA, and Central Massachusetts Regional Stormwater Coalition (CMRSWC). Through document analysis, interviews, and training sessions, we were able to assess compliance with the 2003 MA permit for Auburn, Holden, and Upton, while also serving as an educational resource to them on stormwater management. Additionally, we assisted the three towns by recording Global Positioning System (GPS) locations of their stormwater infrastructure. For our final objective, our team developed a database that has the capacity to priority rank catchment areas based on criteria found in the 2013 NH draft permit. A catchment area is a portion of land that drains to one outfall, incorporating all the catch-basins, manholes and piping within the area. After interviewing municipal officials, we incorporated their feedback within the database. Our team formed a number of findings and recommendations after compiling and analyzing the data collected throughout our study. When analyzing each municipality’s compliance with the 2003 MA MS4 permit, we found that the 2013 annual reports were not an accurate representation of the subject town’s permit compliance. Municipalities submit an annual report to the US EPA summarizing their stormwater management programs. Often times municipalities either under- or over- state their procedures because there is no template to follow when completing the annual report. To help with this, we recommend that the US EPA develop a standardized reporting form explicitly stating all of the requirements to ensure that municipalities correctly report their SWMPs. Throughout the interviews we conducted with municipal stormwater officials, a common trend appeared. The granularity, that is the level of detail, of the upcoming permit demands far more time, manpower and funding than municipalities are capable of providing. The officials felt that the upcoming permit was very specific and will be a major challenge for municipalities to overcome. We recommend that for future permits, the US EPA make incremental changes to stormwater regulations so as to not overwhelm the municipalities and give them the greatest chance of success in their stormwater programs. While working with stormwater officials from the different municipalities of the CMRSWC, our team found little uniformity in municipal stormwater management programs. Every official that we interviewed had a different knowledge set and a unique interpretation of permit requirements. Our team also observed that there is no specially designated position, within a municipality, for stormwater management. We recommend that municipalities regionalize in order to collaborate efforts and resources to further their SWMPs. We also recommend that the US EPA mandate a yearly stormwater training for municipal stormwater officials in order to ensure that municipalities understand what they need to do to fully comply with the MS4 permit. While studying the Catchment Area Priority Ranking requirement within the 2013 NH draft permit, we found that the priority ranking process is difficult and confusing to interpret. We recommend that the US EPA clarify this requirement within the upcoming MA MS4 permit by explicitly defining the categories for ranking and criteria used for prioritizing. In order to assist municipalities with fulfilling the priority ranking requirement of the new Massachusetts permit, our team developed the Catchment Area Priority Ranking System (CAPRS) Database. We recommend that a future WPI student research, or other independent research team conduct a pilot test of the CAPRS Database to evaluate its functionality and effectiveness. Stormwater pollution is a relatively new environmental issue that is rapidly gaining traction in the plans of local governments. Many municipalities are more accepting of stormwater regulations and are working together to improve regional stormwater management. However, the problem of stormwater is vast and will require a great deal of time and effort to resolve. Although municipalities need to improve their stormwater management programs, the difficulty of this task must be acknowledged and municipalities cannot be overwhelmed with regulations. If municipalities are given proper assistance, great strides can be made to improve the health of our rivers, lakes and streams in years to come. EPA. (2003). After the Storm. Retrieved from http://water.epa.gov/action/weatherchannel/upload/2008_09_12_weatherchannel_after_the_storm-read2.pdf. Oana, V. V., Ioan, O., & Andrei, F. (2010). Types of water pollution: point source and nonpoint source. Aquaculture, Aquarium, Conservation & Legislation, 3(5), 393-397. Robert, Y. G. A. (2007). A NEW TOOL for Fighting STORMWATER RUNOFF (Vol. 39, pp. 28). Troy: BNP Media. Valley, C. W. C. o. W. Municipal Separate Storm Sewer System(MS4) Interesting Facts.